They twirled and gyrated like demented dervishes, their tattered grass skirts flailing to the throbbing beat of the coarse wood-and-skin drums beaten methodically by apparently captive men at the centre of their circle. Barely concealed by shreds of river grass and rough shell necklaces, their long-exhausted, pendulous breasts swung in full rotations as they yelped and threw their arms ecstatically in the air. Was it some macabre celebration or a sacrificial ritual? We had no idea, but like dumbstruck voyeurs, we stood, riveted, as the rowdy spectacle unfolded. We were treated to an obligatory "sing-sing" at almost every village. Each portrayed the unique local cultures and rites significant to the respective region through a choreographed performance of dance, music, and costume. Some were more easily interpreted, like the muscular, well-oiled men who paddled invisible canoes, chanting musically with each empty oarstroke. Or when delicately adorned maidens sang sweetly of harvesting yams and taro. But this display, deep in the seldom-visited backwaters of the mighty Sepik River, spoke of darker, more sinister things. Papua New Guinea’s Sepik River is one of world’s great waterways. Although the straight-line distance from source to mouth is barely 500 kilometers, its wide channel twists and turns in a convoluted course that, if stretched out, would cover over 1100. 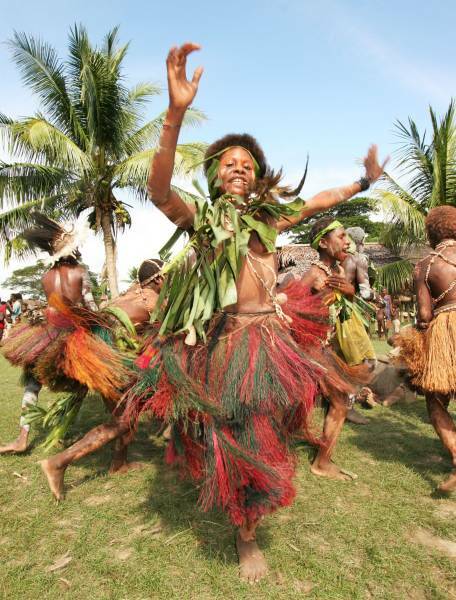 Europeans were first introduced to the mystical wonders of the Sepik when German colonialist Dr Otto Finsch brought back tales of crocodiles, wild tribes, and unfathomable ceremonies after a 50-kilometer journey upstream in 1885. Our journey — aboard the 2000-ton, 76-passenger Oceanic Discoverer — doubled the pioneering German’s historic penetration and reached as far as the village of Kambaramba, a genuine frontier community that wholly reinforces Dr Otto’s 120-year-old observations. The word "Sepik" is synonymous with the distinctive handicrafts and carvings that emanate from the many tribes and clans that dwell along its banks. Intensely symbolic and richly carved, these ornate pieces are highly prized by collectors worldwide and all but dominate the Melanesian art market. Commercial expedition adventures up the Sepik, begun about 30 years ago, were driven mainly by ethnological dilettantes and enthusiasts of primitive art. Not a great deal has changed, except that the quality of watercraft now plying the wide, turbid waters meet the expectations of modern, 21st-century travelers. As our tender probed for a landing site at the tiny village, we were greeted by a typically boisterous, exuberant crowd clearly excited by our arrival. Rampant tikes sprinted sideways along the shore, hopping and waving, trying to anticipate our beachhead. Eventually the captain located a safe berth, and we filed ashore into the midst of a swelling throng of leering children, unsuccessfully restrained by a Rastafarian-type brandishing a nasty-looking cane. A muddy path led to the settlement proper; a simple array of grass, reed, and wood stilt huts arranged along the bank of a very minor tributary. The single AUSAID (Australian government aid) rainwater tank, a solar panel, and tattered secondhand NRL rugby tops were the only clues to contact with the outside world. Meanwhile, as the circular frenzy continued, I looked to Dr Nancy Sullivan, our accompanying anthropologist, for some interpretation. But she, too, seemed mesmerized as these ash- and ochre-smeared banshees ramped up their routine. My camera, clicking constantly, was capturing all manner of bizarre gesticulations when suddenly one particularly enthusiastic member caught my eye. Fixing her determined gaze upon me, she crouched forward as if to attack. With eyes ablaze and arms and legs flapping every which way, she moved in on me until I could see nothing but her crazy gap-toothed grin in my lens. Then, with a demonic yelp she suddenly wheeled back and joined her stomping troupe. Surrounded by highly amused villagers convulsed with delight, Nancy too was beside herself, laughing and clapping almost as wildly as the locals. Clearly I was the focus of their palpable mirth. The performance wound up to rapturous applause from the substantial crowd. Bypassing the few remaining carvings laid out for our inspection, I made a polite but purposeful beeline through the crowd to our waiting transport, all the while a disturbingly vivid image of my mud-splattered enchantress persisted.